Would you like to cooperate with us or publish own press mailings / articles / pictures / messages? Then feel free to contact us. Copyright 2017-2019 by marathonrally.com RBI Association. All Rights reserved. You may access and view the content on the Web Site on your computer or other device and, unless otherwise indicated in these Terms and Conditions or on the Web Site, make single copies or prints of the content on the Web Site for your personal, internal use only. Unless otherwise specifically indicated in these Terms and Conditions or on the Web Site, use of the Web Site and the services offered on or through the Web Site, are only for your personal, non-commercial use. Unless otherwise specifically indicated in these Terms and Conditions or on the Web Site, you agree that: A) if you include a link from any other Web Site to the Web Site, such link shall open in a new browser window and shall link to the full version of an HTML formatted page of this Web Site; B) you are not permitted to link directly to any image hosted on the Web Site or our services, such as using an "in-line" linking method to cause the image hosted by us to be displayed on another Web Site; and C) you agree not to download or use images hosted on this Web Site on another Web Site, for any purpose, including, without limitation, posting such images on another site. You agree not to link from any other Web Site to this Web Site in any manner such that the Web Site, or any page of the Web Site, is "framed," surrounded or obfuscated by any third party content, materials or branding. We reserve all of our rights under the law to insist that any link to the Web Site be discontinued, and to revoke your right to link to the Web Site from any other Web Site at any time upon written notice to you. Unless otherwise specifically indicated in these Terms and Conditions or on the Web Site, any commercial or promotional distribution, publishing or exploitation of the Web Site, or any content, code, data or materials on the Web Site, is strictly prohibited unless you have received the express prior written permission from our authorized personnel or the otherwise applicable rights holder. Other than as expressly allowed herein or on the Web Site, you may not download, post, display, publish, copy, reproduce, distribute, transmit, modify, perform, broadcast, transfer, create derivative works from, sell or otherwise exploit any content, code, data or materials on or available through the Web Site. You further agree that you may not alter, edit, delete, remove, otherwise change the meaning or appearance of, or repurpose, any of the content, code, data, or other materials on or available through the Web Site, including, without limitation, the alteration or removal of any trademarks, trade names, logos, service marks, or any other proprietary content or proprietary rights notices. You acknowledge that you do not acquire any ownership rights by downloading or otherwise using any copyrighted material from or through the Web Site. If you make other use of the Web Site, or the content, code, data or materials thereon or available through the Web Site, except as otherwise provided above, you may violate copyright and other laws of the United States, states of the European Union or other countries, as well as applicable state laws and may be subject to liability for such unauthorized use. Bereits im zarten Alter von 12 Jahren gründeten zwei deutsche Buben ein kleines Automagazin namens "DER AUTOSPIEGEL" - aufgrund nicht-erfundener PCs noch mit Schreibmaschine, handgemalten Überschriften und selbst entwickelten Fotos. Das Heft wurde DIN A5 schwarz-weiss mit Hilfe eines Fotokopierers hergestellt, die Kosten übernahmen die Eltern oder ein örtliches Opel-Autohaus. Im Laufe der Jahre wurde das Magazin professioneller, mit der Erfindung von Home-Computern setzte man früh auf "Apple Macintosh". Diesen konnte man sich zwar nicht leisten, durfte aber nach Ladenschluss die Technik eines Händlers benutzen. Vorerst blieb es aber bei einem Jugend-Hobby. Aus Buben wurden Männer, man ging beruflich neue und verschiedene Wege. Doch mit der Verbreitung des Internets Ende der 90er Jahre kam der Gedanke an ein Magazin zurück. 1999 war es dann soweit: Man startete mit AUTOSPIEGEL.COM das erste Online-Automagazin im deutschsprachigen Internet. Als Nische entdeckte man die Berichterstattung über die Rally Dakar: Damals ein absolutes Novum. 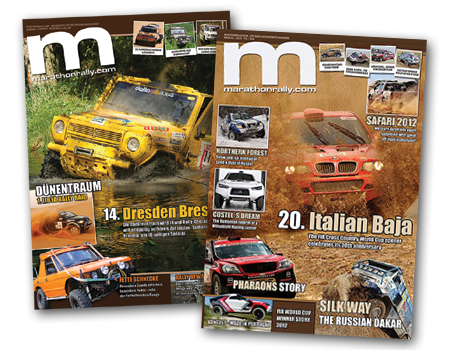 Das interessierte die Industrie: Auf einer Veranstaltung im Rahmen des Dakar-Starts Ende 2002 in Marseille gründete man spontan auf Anregung von Mitsubishi-Motorsport und Journalisten das erste Online-Magazin für den Offroad Motorsport: MARATHONRALLY.COM. Mit Rückenwind der Industrie startete man durch, zuerst nur auf Deutsch, ab 2006 dann auch auf Englisch und Ungarisch. Es entwickelten sich neue Geschäftszweige: Gemeinsam mit dem Unternehmen "Normann Bock" konstruierte man bis zum Tode dessen Inhabers unter dem Label MARATHONLOGISTIC.COM Nutzfahrzeuge für den Motorsport, man startete als Berater für Rallies und die Offroad-Industrie. 2008 folgte das erste Print-Magazin, 2012 die erste Test-Ausgabe in Englisch. Doch die Ereignisse überschlugen sich. Soziale Medien wie Facebook waren fortan mehr gefragt, die Online-Technik veränderte sich rapide. Hohe Investitions- und Lohnkosten nötigten die nun über 40-jährigen Herausgeber zu einer kreativen Pause. Doch die Nachfrage blieb. Soziale Medien entwickelten ein Eigenleben, der Ruf nach klassischen Medien wurde wieder laut. Mit einem neuem Geschäftspartner entschied man Anfang 2017: MARATHONRALLY.COM kommt zurück! 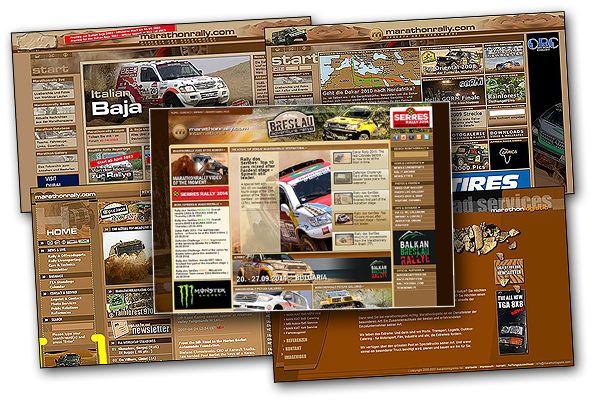 Mit neuem Design und neuer Technik war man zum Start der Dakar Rally und Africa Eco Race 2018 soweit: Willkommen bei marathonrally.com 4.0. - Contact our customer service department with an enquiry, comment or suggestion. Please remember that any information you disclose in these public forum or community areas becomes public information and is immediately accessible to other users, so it is important for you to carefully consider what, if any, personal information you reveal in these areas. We may use information disclosed by you in this way to promote our products and services in our advertising communications. App Usage: We collect information about your installation, use, and updating of our Apps, such as information about your device, your use of our App, the pages, videos, other content or ads you see or click on during your visit and when and for how long you do so, and items you download. We use this information to enable the App to function correctly on your device and to provide you with the appropriate content through the App. We can collect your device.s geographical location for the purpose of presenting you with relevant content, provided that you have given your prior express consent via your mobile device. Local Shared Objects: Local shared objects, such as .Flash cookies,. also may be stored on your computer or device. Local shared objects operate a lot like cookies, but cannot be managed in the same way. Depending on how local shared objects are enabled on your computer or device, you may be able to manage them using software settings. For information on managing Flash cookies, for example, see ADOBE FLASH INFO. If this process leads to your being placed on our marketing mailing list, you can remove yourself from the list by unsubscribe (click on "Newsletter") or by otherwise contacting us as described in the "How to Contact Us" section below. You can also remove yourself from an e-mail marketing list by clicking the "unsubscribe" button that appears on our e-mails. Third Party Products and Services: If you are a subscriber to one of our publications or on-line newsletters, disclosures we give you when obtaining your personal information and your indicated preferences may lead to your contact information being shared with carefully selected marketing partners who will contact you by mail or e-mail with offers about products and services that may be of interest to you. By using our Services you consent to us sharing your personal information in this way. You can remove yourself from the future sharing of your contact information with third parties by contacting us as set out in the "How to Contact Us" section below. Sale or Merger of Business: It is possible that all or part of RBI Association marathonrally.com or its subsidiaries could merge with or be acquired by another business or undergo a corporate change or dissolution such as a reorganization, consolidation, bankruptcy, liquidation, sale of assets, or wind down of business. If this happens we may share the information that relates to you. Legal: We may provide your personal information in response to a search warrant or other legally valid inquiry or order, or to an investigative body in the case of a breach of an agreement or contravention of law, or as otherwise required by law. We may also disclose personal information to assist us in collecting a debt owed by you, or otherwise where necessary for the establishment, exercise, or defence of legal claims. Our Services may provide links to third party websites or offerings where data privacy practices may be different to that of marathonrally.com / RBI Association. The inclusion of any link does not imply our endorsement of any other company, its websites, or its products and/or services. These linked websites or offerings have separate and independent privacy policies, which we recommend you read carefully. We have no control over such websites or offerings and therefore have no responsibility or liability for the manner in which the organizations that operate such linked websites or offerings may collect, use, disclose, or otherwise treat your personal information. We will take reasonable steps to accurately record the personal information that you provide to us and any subsequent updates. We encourage you to review, update, and correct the personal information that we maintain about you, and you may request that we delete personal information about you that is inaccurate, incomplete, or irrelevant for legitimate purposes, or are being processed in a way which infringes any applicable legal requirements, by contacting us as set out in the "How to Contact Us" section below. At our election, instead of deleting such information, we may retain it with your comment or correction noted in our records. By contacting us, you may also object to our further use of your personal information if you have compelling legitimate grounds (this may involve closing your account). We may ask you to verify your identity and to provide other details before we are able to provide you with any information, correct any inaccuracies, or delete any information. Your right to review, update, correct, and delete your personal information may be limited, subject to the law of your jurisdiction: A) if your requests are abusive or unreasonably excessive, B) where the rights or safety of another person or persons would be encroached upon, or C) if the information or material you request relates to existing or anticipated legal proceedings between you and us, or providing access to you would prejudice negotiations between us or an investigation of possible unlawful activity. Your right to review, update, correct, and delete your information is subject to our records retention policies and applicable law, including any statutory retention requirements. - You have a complaint about the manner in which we treat your personal information. The following terms and conditions (the "Terms and Conditions" or "Terms of Service") govern your use of this Web Site or application provided to you by RBI Association marathonrally.com or one of its subsidiaries, and any content, features or functionality made available from or through this Web Site, including any subdomains thereof, or application (the "Web Site"). The Web Site is made available by RBI Association marathonrally.com or its subsidiaries ("we" or "us" or "our"), each of which have adopted these Terms and Conditions with regard to its Web Site. We may change the Terms and Conditions from time to time, at any time without notice to you, by posting such changes on the Web Site. By using the Web Site, you accept and agree to these terms and conditions / terms of service as applied to your use of the Web Site. If you do not agree to these Terms and Conditions, you may not access or otherwise use the Web Site. Unless otherwise specifically indicated in these Terms and Conditions or on the Web Site, any commercial or promotional distribution, publishing or exploitation of the Web Site, or any content, code, data or materials on the Web Site, is strictly prohibited unless you have received the express prior written permission from our authorized personnel or the otherwise applicable rights holder. Other than as expressly allowed herein or on the Web Site, you may not download, post, display, publish, copy, reproduce, distribute, transmit, modify, perform, broadcast, transfer, create derivative works from, sell or otherwise exploit any content, code, data or materials on or available through the Web Site. You further agree that you may not alter, edit, delete, remove, otherwise change the meaning or appearance of, or repurpose, any of the content, code, data, or other materials on or available through the Web Site, including, without limitation, the alteration or removal of any trademarks, trade names, logos, service marks, or any other proprietary content or proprietary rights notices. You acknowledge that you do not acquire any ownership rights by downloading or otherwise using any copyrighted material from or through the Web Site. If you make other use of the Web Site, or the content, code, data or materials thereon or available through the Web Site, except as otherwise provided above, you may violate copyright and other laws of the United States, the European Union or other countries, as well as applicable state laws and may be subject to liability for such unauthorized use. By submitting or sending Submitted Materials to us, you: A) represent and warrant that the Submitted Materials are original to you, that no other party has any rights thereto, and that any "moral rights" in Submitted Materials have been waived, and B) you grant us and our affiliates a royalty-free, unrestricted, worldwide, perpetual, irrevocable, non-exclusive and fully transferable, assignable and sublicensable right and license to use, copy, reproduce, modify, adapt, publish, translate, create derivative works from, distribute, perform, display and incorporate in other works any Submitted Materials (in whole or part) in any form, media, or technology now known or later developed, including for promotional and/or commercial purposes. We cannot be responsible for maintaining any Submitted Material that you provide to us, and we may delete or destroy any such Submitted Material at any time. You warrant and agree that, while using the Web Site and the various services, features and functionality offered on or through the Web Site, you shall not: (a) impersonate any person or entity or misrepresent your affiliation with any other person or entity; (b) insert your own or a third party's advertising, branding or other promotional content into any of the Web Site's content, materials or services (for example, without limitation, in an Embedded Video (as defined herein), RSS feed or a podcast received from us or otherwise through the Web Site), or, except as otherwise specifically authorized in these Terms and Conditions or on the Web Site use, redistribute, republish or exploit such content or service for any further commercial or promotional purposes; or (c) attempt to gain unauthorized access to other computer systems through the Web Site. You shall not: A) engage in spidering, "screen scraping," "database scraping," harvesting of e-mail addresses, wireless addresses or other contact or personal information, or any other automatic means of obtaining lists of users or other information from or through the Web Site or the services offered on or through the Web Site, including without limitation any information residing on any server or database connected to the Web Site or the services offered on or through the Web Site; B) obtain or attempt to obtain unauthorized access to computer systems, materials or information through any means; C) use the Web Site or the services made available on or through the Web Site in any manner that could interrupt, damage, disable, overburden, or impair the Web Site or such services, including, without limitation, sending mass unsolicited messages or "flooding" servers with requests; (iv) use the Web Site or the Web Site's services or features in violation of our or any third party's intellectual property or other proprietary or legal rights; or (v) use the Web Site or the Web Site's services in violation of any applicable law. You further agree that you shall not attempt (or encourage or support anyone else's attempt) to circumvent, reverse engineer, decrypt, or otherwise alter or interfere with the Web Site or the Web Site's services, or any content thereof, or make any unauthorized use thereof. You agree that you shall not use the Web Site in any manner that could interfere with any other party's use and enjoyment of the Web Site or any of its services. You shall not obtain or attempt to obtain any materials or information through any means not intentionally made publicly available or provided for through the Web Site. We may, from time to time, make messaging services, chat services, bulletin boards, message boards, blogs, other forums and other such services available on or through the Web Site. In addition to any other rules or regulations that we may post in connection with a particular service, you agree that you shall not upload, post, transmit, distribute or otherwise publish through the Web Site or any service or feature made available on or through the Web Site, any materials which A) restrict or inhibit any other user from using and enjoying the Web Site or the Web Site's services, B) are fraudulent, unlawful, threatening, abusive, harassing, libelous, defamatory, obscene, vulgar, offensive, pornographic, profane, sexually explicit or indecent, C) constitute or encourage conduct that would constitute a criminal offense, give rise to civil liability or otherwise violate any local, state, national or international law, (iv) violate, plagiarize or infringe the rights of third parties including, without limitation, copyright, trademark, trade secret, confidentiality, contract, patent, rights of privacy or publicity or any other proprietary right, (v) contain a virus, spyware, or other harmful component, (vi) contain embedded links, advertising, chain letters or pyramid schemes of any kind, or (vii) constitute or contain false or misleading indications of origin, endorsement or statements of fact. You further agree not to impersonate any other person or entity, whether actual or fictitious, including us or our personnel. You also may not offer to buy or sell any product or service on or through your comments submitted to our forums. You alone are responsible for the content and consequences of any of your activities. Unless otherwise specifically indicated in these Terms and Conditions or on the Web Site, you agree that: A) if you include a link from any other Web Site to the Web Site, such link shall open in a new browser window and shall link to the full version of an HTML formatted page of this Web Site; B) you are not permitted to link directly to any image hosted on the Web Site or our services, such as using an "in-line" linking method to cause the image hosted by us to be displayed on another Web Site; and C) you agree not to download or use images hosted on this Web Site on another Web Site, for any purpose, including, without limitation, posting such images on another site. You agree not to link from any other Web Site to this Web Site in any manner such that the Web Site, or any page of the Web Site, is "framed," surrounded or obfuscated by any third party content, materials or branding. We reserve all of our rights under the law to insist that any link to the Web Site be discontinued, and to revoke your right to link to the Web Site from any other Web Site at any time upon written notice to you. You may be able to link from the Web Site to third party Web Sites and third party Web Sites may link to the Web Site ("Linked Sites"). You acknowledge and agree that we have no responsibility for the information, content, products, services, advertising, code or other materials which may or may not be provided by or through Linked Sites, even if they are owned or run by affiliates of ours. Links to Linked Sites do not constitute an endorsement or sponsorship by us of such Web Sites or the information, content, products, services, advertising, code or other materials presented on or through such Web Sites. The inclusion of any link to such sites on our Site does not imply our endorsement, sponsorship, or recommendation of that site. RBI Association marathonrally.com disclaims any liability for links (1) from another Web Site to this Web Site and (2) to another Web Site from this Web Site. RBI Association marathonrally.com cannot guarantee the standards of any Web Site to which links are provided on this Web Site nor shall we be held responsible for the contents of such sites, or any subsequent links. We do not represent or warrant that the contents of any third party Web Site is accurate, compliant with state or federal law, or compliant with copyright or other intellectual property laws. Also, we are not responsible for or any form of transmission received from any linked Web Site. Any reliance on the contents of a third party Web Site is done at your own risk and you assume all responsibilities and consequences resulting from such reliance. LIMITATION OF LIABILITY. IN NO EVENT, INCLUDING BUT NOT LIMITED TO NEGLIGENCE, SHALL WE, OUR AFFILIATES, OR ANY OF OUR DIRECTORS, OFFICERS, EMPLOYEES, AGENTS OR CONTENT OR SERVICE PROVIDERS (COLLECTIVELY, THE "PROTECTED ENTITIES") BE LIABLE FOR ANY DIRECT, INDIRECT, SPECIAL, INCIDENTAL, CONSEQUENTIAL, EXEMPLARY OR PUNITIVE DAMAGES ARISING FROM, OR DIRECTLY OR INDIRECTLY RELATED TO, THE USE OF, OR THE INABILITY TO USE, THE WEB SITE OR THE CONTENT, FEATURES, MATERIALS AND FUNCTIONS RELATED THERETO, YOUR PROVISION OF INFORMATION VIA THE WEB SITE, LOST BUSINESS OR LOST SALES, EVEN IF SUCH PROTECTED ENTITY HAS BEEN ADVISED OF THE POSSIBILITY OF SUCH DAMAGES. SOME JURISDICTIONS DO NOT ALLOW THE LIMITATION OR EXCLUSION OF LIABILITY FOR INCIDENTAL OR CONSEQUENTIAL DAMAGES SO SOME OF THE ABOVE LIMITATIONS MAY NOT APPLY TO CERTAIN USERS. IN NO EVENT SHALL THE PROTECTED ENTITIES BE LIABLE FOR OR IN CONNECTION WITH ANY CONTENT POSTED, TRANSMITTED, EXCHANGED OR RECEIVED BY OR ON BEHALF OF ANY USER OR OTHER PERSON ON OR THROUGH THE WEB SITE. IN NO EVENT SHALL THE TOTAL AGGREGATE LIABILITY OF THE PROTECTED ENTITIES TO YOU FOR ALL DAMAGES, LOSSES, AND CAUSES OF ACTION (WHETHER IN CONTRACT OR TORT, INCLUDING, BUT NOT LIMITED TO, NEGLIGENCE OR OTHERWISE) ARISING FROM THE TERMS AND CONDITIONS OR YOUR USE OF THE WEB SITE EXCEED, IN THE AGGREGATE, THE AMOUNT, IF ANY, PAID BY YOU TO US FOR YOUR USE OF THE WEB SITE OR PURCHASE OF PRODUCTS VIA THE WEB SITE. Termination. We may terminate, change, suspend or discontinue any aspect of the Web Site or the Web Site's services at any time. We may restrict, suspend or terminate your access to the Web Site and/or its services if we believe you are in breach of our terms and conditions or applicable law, or for any other reason without notice or liability. We maintain a policy that provides for the termination in appropriate circumstances of the Web Site use privileges of users who are repeat infringers of intellectual property rights. The Terms and Conditions, and the relationship between you and us, shall be governed by the laws of Bulgaria. You agree that any cause of action that may arise under the Terms and Conditions shall be commenced and be heard in the appropriate court in Plovdiv, Bulgaria. You agree to submit to the personal and exclusive jurisdiction of the courts located within Bulgaria. Our failure to exercise or enforce any right or provision of the Terms and Conditions shall not constitute a waiver of such right or provision. If any provision of the Terms and Conditions is found by a court of competent jurisdiction to be invalid, the parties nevertheless agree that the court should endeavor to give effect to the parties' intentions as reflected in the provision, and the other provisions of the Terms and Conditions remain in full force and effect.